To properly launch the 2014 Jeep Cherokee, Jeep enlisted the talents of Counting Crows for a concert at Red Rocks Amphitheater on October 12. Jeep is the sponsor for the Red Rocks Summer Concert Series, and the performance—dubbed the Jeep Celebration Concert—closed out what had proved to be an exhilarating 2013 concert season in style. “Colorado is full of devoted Jeep enthusiasts, and we could not think of a more fitting way to celebrate the latest edition to the Jeep family than to host a concert under the stars at Red Rocks with our extended family of Jeep fans,” said Jeff Hines, Chrysler Group director of the Denver business center, in the automaker’s press release. Concert-goers, some of whom were able to earn free tickets from participating Front Range Jeep dealers throughout Colorado, were not just treated to the musical stylings of one of the 1990s’ hottest acts: at the Jeep Celebration Concert, they were also able to get exclusive Jeep gear and get an up close and personal peek at the 2014 Jeep Cherokee. Further, those fans who happened to also be Jeep owners were treated to premium, “Jeep only” parking. 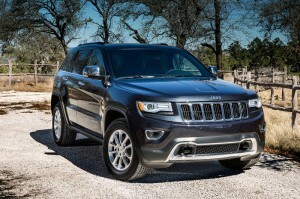 The 2014 Jeep Cherokee will start appearing at dealerships in the U.S. soon. Why not consider picking one up for a ride with your friend, Mr. Jones. And if you felt particularly symbolic yesterday, you could get the Cherokee in gray (or Billet Silver Metallic Clear, anyway). We know gray is your favorite color. This post is sponsored by Perry Chrysler Dodge Jeep Ram.